Nowadays, i am not busy and i spend a lot off time to blogger.com. Previously, i wrote on How to warn your blog visitors from any type of prank. 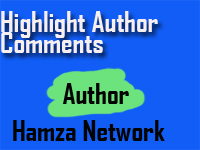 I will tell you today that how to highlight blog author comments in blogger. Blog author comments are specific and visitors must have to know that this is the comment of blog author otherwise they can,t understand your blog easily. After doing below method, your comments will look different from others. 1. Login to Blogger >> Go to Template and click on Edit Html. 2. Check Expand Widgets Elements. 4. Then find the following code. 5. You have to add blue code at the same position and your position must be correct. 6. Now you can see changes on your comments in blogger. Please give your feedback for this beautiful tip.